�Mary K. Greer, author of Who Are You in the Tarot? Each of us has a shadow that darkens our inner and outer lives. In Tarot for Troubled Times, Shaheen Miro and Theresa Reed show us how working with the shadow�facing it directly, leaning into it rather than away�releases power that can free ourselves from negative mental habits and destructive emotions to find healing ourselves and others. Tarot, as the authors show, offers a rich and subtle path for this profound transformation. Through this book, you will discover a different approach to tarot, life, and self-empowerment. 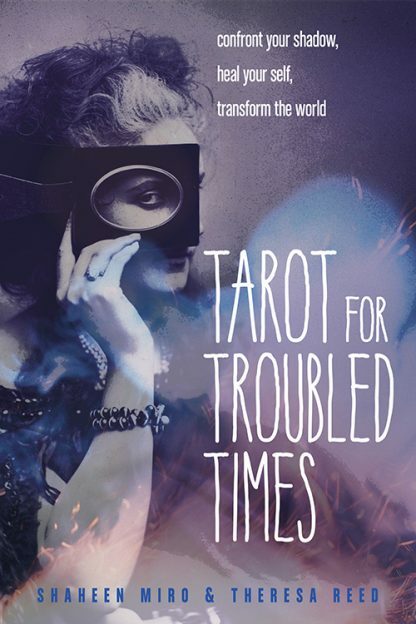 Tarot for Troubled Times is not just another book on how to read the tarot�the authors provide specialty readings and suggested practices for issues such as grief, addiction, depression, fear, anger, divorce, illness, abuse, and oppression, and provide practical suggestions for stepping up as an ally or leader so that you can shape social policies. With a selection of mindful, introspective tarot spreads, you�ll learn how the Tarot can help you rewrite your healing story and change your life, and help transform the world. Shaheen Miro is an intuitive consultant, energy worker, artist, writer, and spiritual nomad. Through Intuitive guidance, and spiritual cleansing techniques Shaheen helps people transform their lives, concisely manifest their reality, and connect with their spirit. He is the creator of the Lunar Nomad Oracle. Theresa Reed is the host of the Astrology Bytes podcast. She has been a professional, full-time astrologer and tarot reader for over 25 years. Her monthly horoscopes and Star School astrology series are two of the most popular features on her online platforms. She has been featured on Nylon, Refinery29, The Numinous, mindbodygreen, Real Talk Radio, Beyond Worlds, and Spirituality and Health and has appeared on numerous other podcasts, radio shows, and WebTV. Visit her at thetarotlady.com.